So here’s the first lecture from the four-lecture minicourse that Frederic Haglund is giving us on CAT(0) cube complexes. Remember my blog post on special cube complexes and how that was not so great for non-mathematicians? These are pure notes so they’re really aimed at someone like me: beginning-middle graduate students. Last night I went to two birthday parties. The first was a dinner and house party, while the second was a bar crawl. So I figured I’d bring these bomb brownies to share at the first one. Little did I know that I’d memorize the recipe, and then drunkenly recreate these for the second party, which ended up back at my house for awhile. Generally, I don’t like brownies so much. I find them too rich, and I’m not a big chocolate fan. 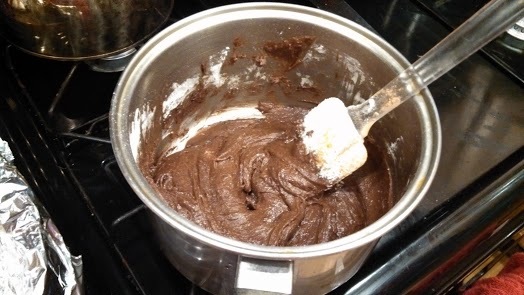 But I’m in the far minority on this, so whenever I’m baking and assured that I won’t have to eat most of the baked goods, I like to make brownies. Plus they’re super easy and you only have to clean a single pot, a spatula/wooden spoon, and a knife (for cutting) at the end. Also I forgot about my blog until halfway through the process. Step one: melt butter. I feel like all good things I make start with melting butter (breakfast, baked goods, barbecue… okay I’ll stop with the gratuitous alliteration now, promise). Mix in your cup of sugar, bit of vanilla, two eggs. Technically you should whisk together your flour, baking powder, and salt before adding them in to the pot, but that would take away from the glory of only having to clean one dish. Just make sure you mix well. Using a whisk is the smart way to mix in those ingredients so you don’t get little pockets of baking powder or salt in the batter. Therefore, I used a spatula. The spat-u-la? More like the spat-I-LOVE! Then you USE THE BROWNIES SECRET. I cannot stress this enough. Just as the silpat is the secret so you don’t have to wash your cookie sheets (though I did for those scones, which were way fatty and oozed butter onto the sheet), aluminum foil or parchment paper is the way to not wash your brownie pan/roasting pan/pyrex. Also, it is way hard to get those edge pieces of brownie out from the sides of a pan. 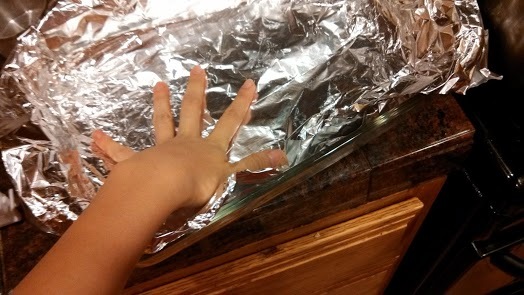 With the foil trick you LIFT the brownies out and everything’s easy peasy! First, here’s my schematic: You use two pieces of foil, both a little bit bigger than the pan. 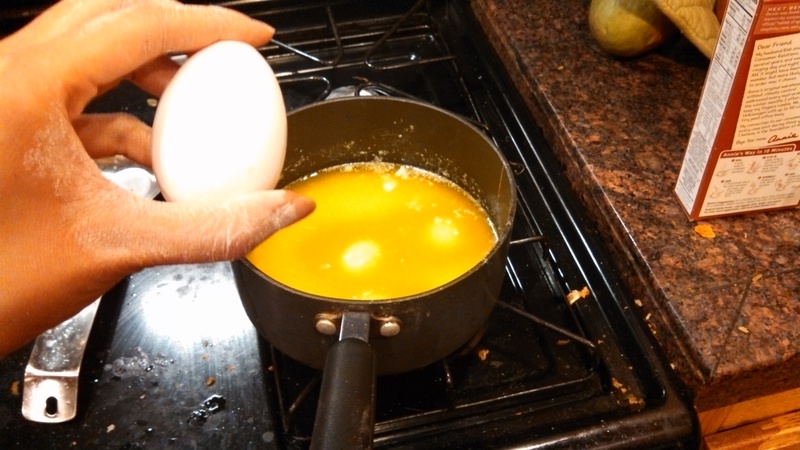 Lay the first one down across the pan and wrap the overhang. Then lay the second one transversely. This is magical. This link has a much better diagram if the MSPaint didn’t convince you: http://www.thekitchn.com/easy-lifting-using-aluminum-fo-62733. I also have a photo of myself attempting this. I was FOILED from taking a good picture. 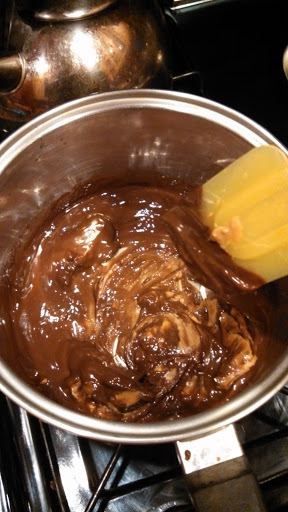 So throw your batter in there, and bake at 375 for 17-19 minutes. 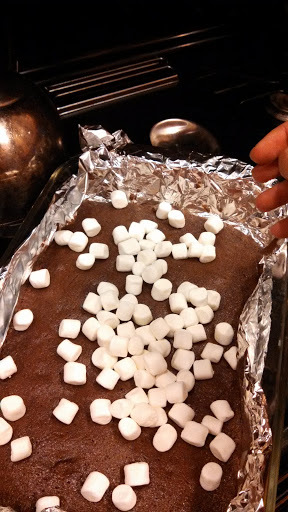 You *don’t* want to fully bake the brownies, because you’re going to take them out and throw MINI MARSHMALLOWS on them. I love using marshmallows. They’re just so cute and fluffy. It’s always marshmallow, marshmallow, marshmallow! What about Jan-mallow? 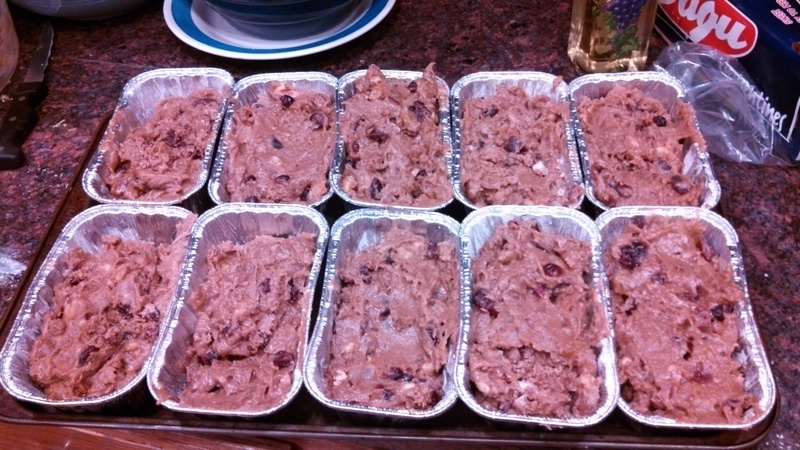 The recipe I used says two cups, I say just throw on some handfuls until you’re almost covered. Then bake for another 5 minutes until they’re all puffed up and beautiful and maaaaybe just starting to get toasty brown on top. There’s nothing you and I won’t do. I’ll stop the oven and melt with you! Use your trusty spatula to smear those marshmallows around to cover any holes, then put the whole pan outside where it’s 18 degrees outside. Or put it in your fridge. It’ll take longer to cool in the fridge. Meanwhile, clean your single pot so you can use it again to make the crispy topping. I’m poor-ish, so I usually buy generic everything and rarely know the difference. Know this, internet: there is a HUGE difference between Rice Krispies and the grocery store’s generic puffed rice. I try to make up for the difference by throwing the puffed rice in the toaster oven for a few minutes, and that helps a lot. 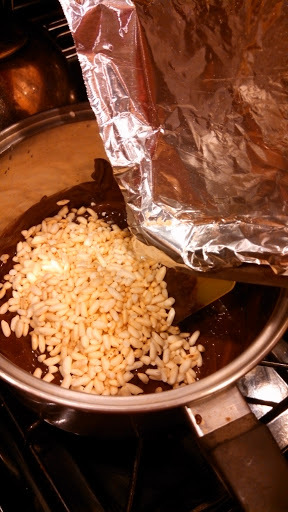 You just want the crispiness, or else your puffed rice sort of sogs into the melted chocolate and everything is bad. Anyways. Melt your butter again, just a bit, and once that’s melted, turn off the heat. 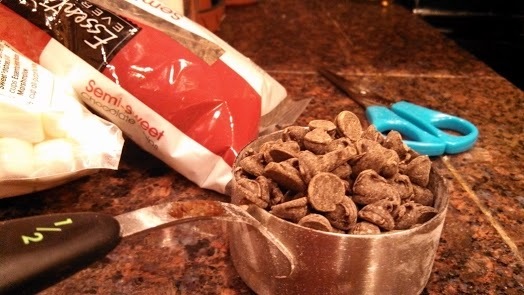 You’ll throw in 2/3 c chocolate chips and 1/2 c peanut butter. Do you prefer chunky or creamy? I guess it doesn’t matter if you spit rather than… wait. I meant. Yay peanut butter! This caption is a new, very disgusting low. I’m really good at reading, so I used my 1/3 c measure for the peanut butter first. Heaping more on top makes it about 1/2 c, right? 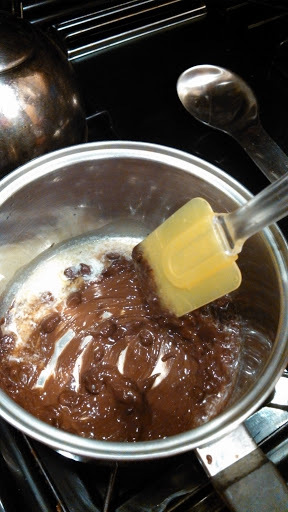 Mix in the chocolate chips until they’ve melted from the residual heat of the pan and the butter. There’s no need to have the heat on for this part. If I have other, better pots, but keep using this one, does that count as nePOTism? 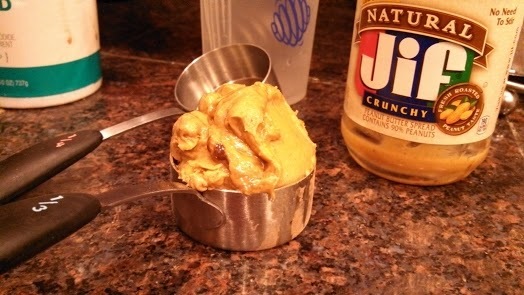 Then mix in the peanut butter. If I was baking with a friend named Reese, I’d have him stir so I could say Reese is piecing it all together right here. Once that’s all smooth, add in your toasted puffed rice krispie-wannabe stuff, and mix that up fast. Check out this spatula while my baker revolves it. Rice, rice baby. Now you can spread this deliciousness on your cooled brownies. 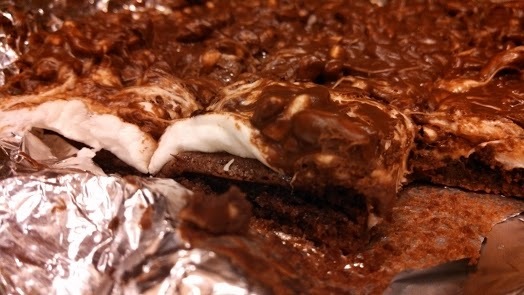 You just want it so the marshmallow goo sets enough to not melt into the topping while you’re spreading. I like this photo uploader. Ooey GUI. Throw this outside again while you’re washing the single pot and spatula. Then LIFT your aluminum foil flaps and voila, you haven’t lost any brownie to the corners of the pan. And the pan is clean! In my case, I then wrapped the whole thing in parchment paper and foil, and biked it off to the party. I recommend using a buttered knife to cut through the marshmallow/rice layer on top. 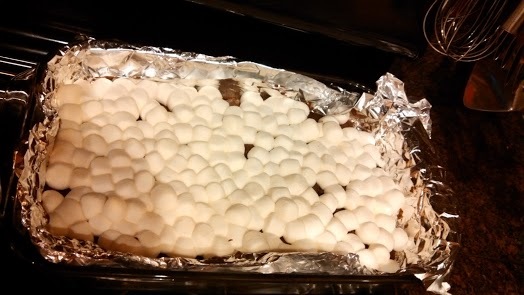 The second time I made these, I threw the peanut butter in with the first pot of melted butter and had peanut butter brownies topped with marshmallows and chocolate chips. Too lazy to make the topping. Still good! 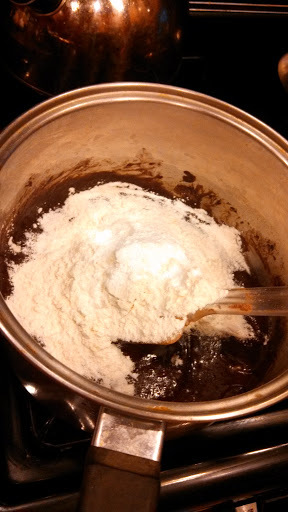 I’d like to experiment with sea salt and/or cayenne/chipotle brownies. Let me know if you have any good recipes or ideas for those. Bake in a 375 oven for 17-19 minutes. and continue baking for 5 minutes. Chill. Spread this on your chilled marshmallow brownies. Chill for at least an hour to give the chocolate time to firm up. Enjoy! I’ve either got the flu, mono, an iron deficiency, the stomach flu, or nothing wrong. In any case, during algebraic topology class today instead of paying attention to applying the Lefschetz fixed point theorem to the homology of spheres, I started googling on my phone for ‘fruitcake with ginger’. 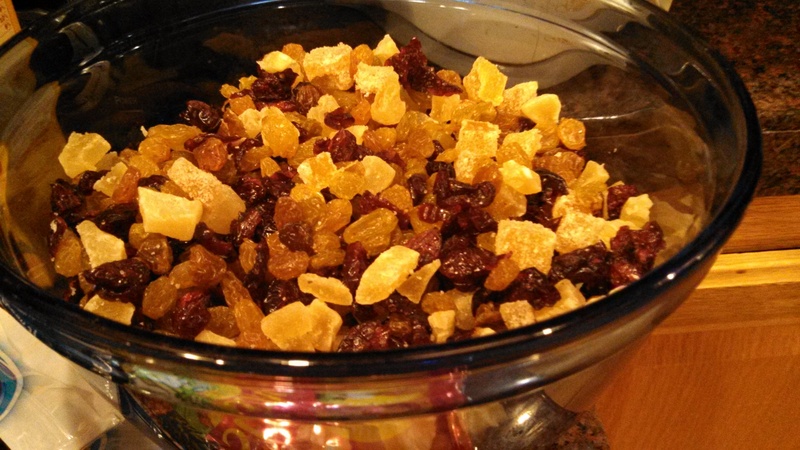 Right now I have six cups of dried fruits soaking (“macerating”) in brandy. Wow fruitcake is expensive! And time consuming. Well, go big or go…. I guess just go big. Because I’m already home. I’ve never bought brandy before. I was surprised by the cork top! Brandy! Not the teen star. 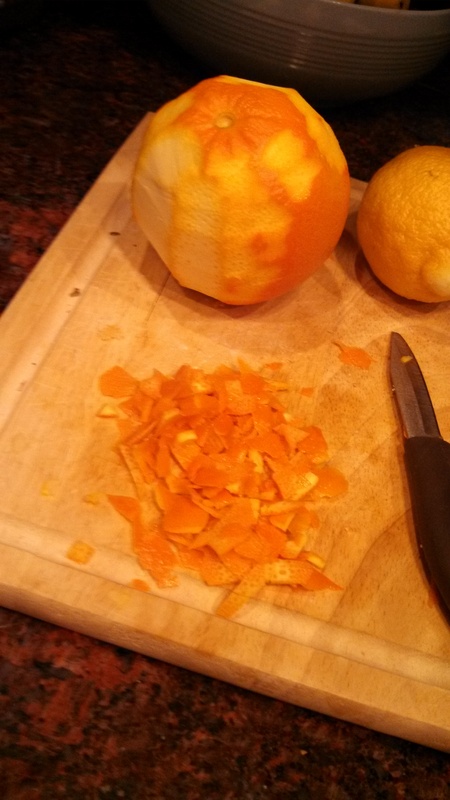 Also both my peeler and grater were hopelessly dull so I ended up chopping up some orange and lemon peels with a sad little paring knife. All work and no play makes Grater a dull… grater? After 24 hours in the brandy, I started putting together the rest of the recipe. So many dry ingredients and spices later, I realized that I needed a POUND AND A HALF OF BUTTER. Holy clogged arteries, Batman! Good thing my house shops at Costco. 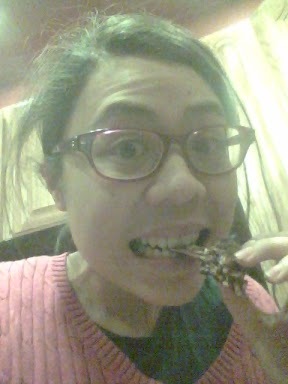 I found some in the freezer and melted it over low heat so as to not brown it, licking my fat-loving lips the entire time. Err I meant I was disgusted. By how gross it was. Deliciously gross. (Last few sentences are on behalf of my health-conscious boyfriend). I wish you could see how much butter this is. It’s SO MUCH BUTTER. I whisked the eggs into the melted butter, which I was afraid would poach the eggs in butter (and come on, how delicious would that be?? 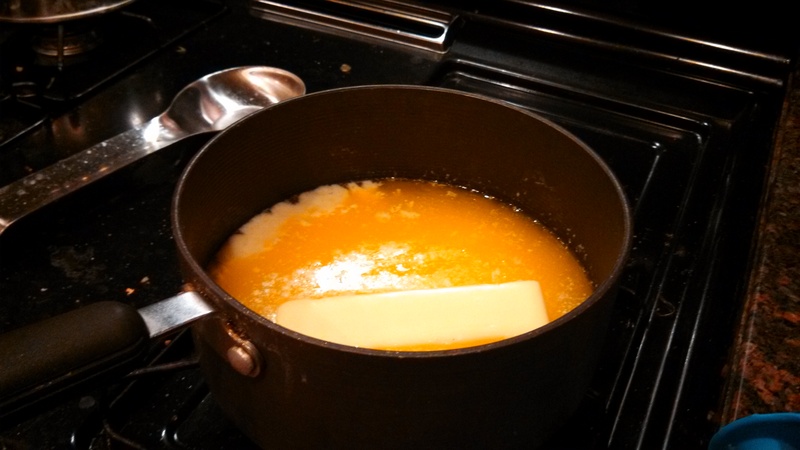 ), but luckily the butter had cooled by then. This is about when I realized that I had already used my two of my largest b0wls, one for the alcoholic fruit, and one for the 10 cups of dry ingredients. There was no way to mix them with the pot of golden splendor. So I ended up mixing about half of all the things together at one time, and then the other half. Finally, I slapped about three spatula-fulls of batter into each of my mini-loaf pans, which I bought because they were on sale at the store and came with teeny lids, and threw it in my 275 degree oven. All that’s left is to let them cool, wrap them up, and baste them in brandy every few days for a few weeks. I’ll update later on how this turns out! Here’s the recipe, adapted from a random recipe on allrecipes. 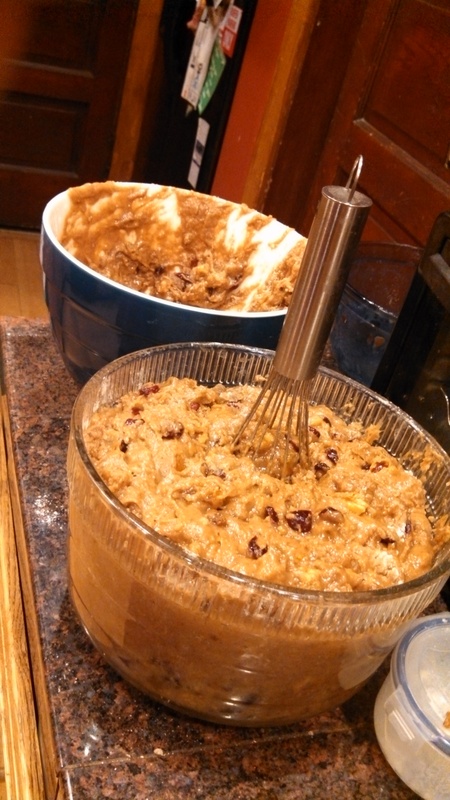 with the fruits, the dry mix, and 3 C toasted walnuts. Pour into N greased and floured mini loaf pans (I had N=10, but I think N=8 or 9 would also be fine), and bake in a 275 oven for 2 hours. 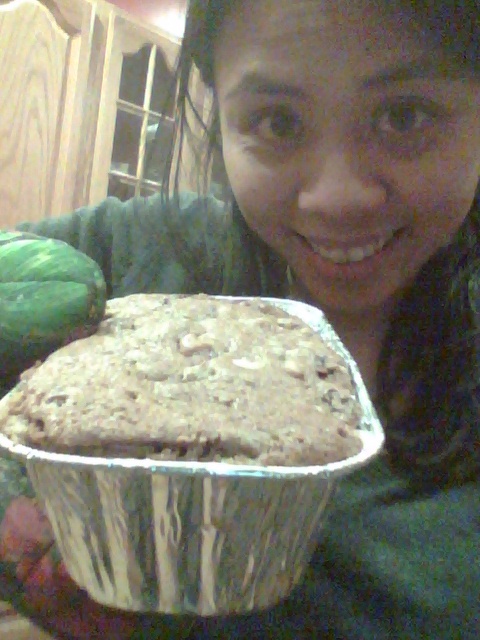 Let the cake cool completely, then wrap in foil. Sprinkle 2 TB of brandy over it every other day until you forget about it. Eat about a month later.